A colony of lightbulb tunicates. Note the visible pink endostyle and dorsal lamina lines. Photo by Jenn Burt. This social ascidian got its common name from the two glowing pink lines (which are the endostyle and dorsal lamina) that run lengthwise along the inside of each individual, in a manner reminiscent of lightbulb filaments. These lines are clearly visible through the nearly transparent body of the tunicate, which is club shaped (another way in which it is similar to a lightbulb) and reaches 5 cm tall. 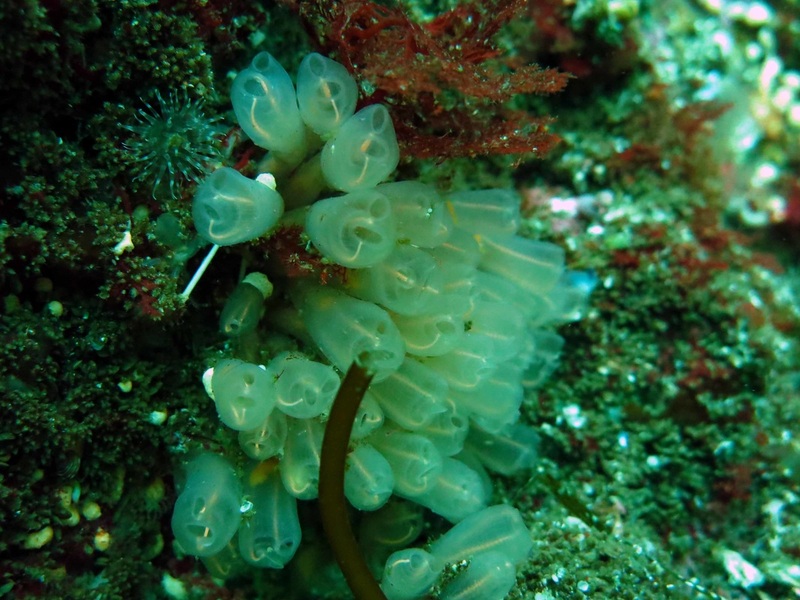 The lightbulb tunicate grows in clusters up to 50 cm wide. The lightbulb tunicate appears in late winter, persists through most of the following year, and dies back in autumn. Colonies grow on rocky ledges and vertical faces in exposed or current-swept locations, from the intertidal to 30 m deep. Its range extends from British Columbia to San Diego, California; Lamb and Hanby also report its presence in southern Alaska. 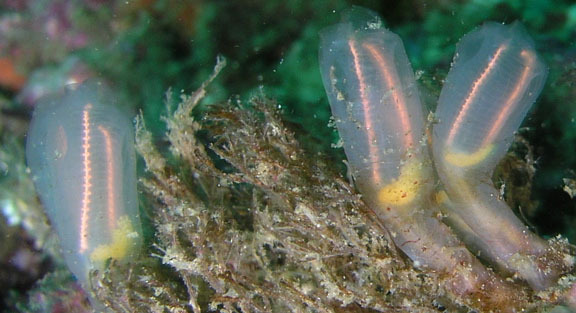 The tunic-band compound tunicate (Euherdmania claviformis), which is mostly found in California, is less transparent, making the pink "lightbulb filaments" less visible. Cowles, D. (2010). Clavelina huntsmani, Van Name, 1931. Invertebrates of the Salish Sea. Rosario Beach Marine Laboratory. Accessed 24/11/2015. Watanabe, J. (2011). Clavelina huntsmani Van Name, 1931. SeaNet: Common Common Marine Organisms of Monterey Bay, California. Stanford University, Stanford, California. Accessed 24/11/2015.